Tony Stuart is a Wallabies supporter born in New Zealand - yes, there is such a thing. In fact, Sydney-based Mr Stuart will tell you "there's more than a lot of people realise". The 58-year-old from the Wairarapa will be at Twickenham on Sunday morning, proudly wearing his gold jersey and waving his Wallabies scarf. "When it comes down to it," he explained to the Herald from London this week, "I'm going to support the country that has embraced me as one of their own for the last 20 years. "I'm proud to call Australia home, even though I'm proud to be of New Zealand heritage." Mr Stuart said there is even an acronym for people like him - ABINZ (Australians Born In New Zealand). However, being an ABINZ means you attract a fair amount of friendly abuse, he said. "I get grief, not just from my family and friends in New Zealand but I get grief from my English friends, who struggle with the concept." Mr Stuart moved to England after studying at Canterbury University and when he eventually decided to return down under in 1997, he and his English-born wife chose Australia. He has been there ever since. "When I became an Australian, for the first two years I used to bet a bottle of red wine against my [Kiwi] brother. I think I won two or three bottles. "I've given him a bottle for every Bledisloe test for the last 10 years and my cellar's virtually empty. But I'm hoping to win one or two back over the next couple of years." Mr Stuart flew over to the Rugby World Cup at the end of September and during the past five weeks has watched 10 games, including all of the Australian matches and the All Blacks twice. "I'm over here with my nephew who is [an All Blacks supporter]...and my son, who is born in Australia but actually favours the All Blacks. So he's been wearing black," he said. "A son who's born in Australia but supports the All Blacks and a father who is born in New Zealand but supports the Wallabies - how's that for a dysfunctional family?" A big supporter of Australian coach Michael Cheika - "the dice is rolling his way" - Mr Stuart thinks the final is going to be very close. "I like what Cheika has done to the Australian team, which is to create an extraordinary, positive psychology. 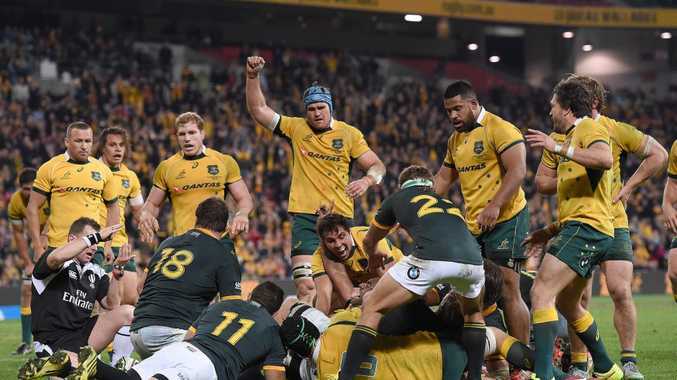 He's been exactly what Australian rugby needed." However, Mr Stuart is still willing to admit he has a soft spot for his former countrymen. "I am the first to say that the All Blacks deserve to win. I think this current team has taken the game to another level. As somebody who went to university in Canterbury, nothing would make me prouder than to see Richie McCaw hold the World Cup in his final. "But I've always felt that if I'm going to vote as an Australian in the election, I want to support Australia in its sporting codes..."
And so on Sunday Mr Stuart will be wearing his beloved Wallabies jersey at the home of English rugby and standing alongside his nephew from Taupo, who will be dressed in black. "We'll be black and yellow...one of us will be very happy at the end of the day."